Villard Augustin was born on March 15th, 1959 in Borgne, Haiti, one of 12 children to the late Chery Augustin and Maria Petit-Frere, Villard was a handsome addition to the family. At the ripe adult age of 19 he relocated to The Bahamas where he settled to begin a new life. As a young adult Villard became fascinated with painting and quickly developed this to be his professional trade. Being very skilled and passionate about painting he was well known among his family, friends, and coworkers for his immaculate skills. Villard was the type of painter who did not need to prep or use the blue painter’s tape to begin. His entrepreneurship and notoriety provided great opportunities to work for companies (large and small) in the Bahamas—Villard’s work spoke for itself. Known to everyone affectionately as “Villa”, He was a social butterfly that would make friends anywhere he went. Villa always had a story to share about his journey throughout life while sharing laughs (and happiness) with his unforgettable jokes. His sense of happiness was evident in his consistent smiles and positive energy that spoke one thing –that this is man who knows how to enjoy life despite its challenges. He loved singing and playing music, watching the Animal Planet channel and was an avid fanatic of The WWE Wresting where he would watch his favorite wrestler “The Undertaker.” Villa very much enjoyed spending time with his grandkids whenever possible. In 1999, Villard give his life to Christ and encouraged family and friends to step out on faith and trust God’s plan. He was an active member of his church in the Bahamas and later in the Kissimmee area. As a husband and a father, he was known as a provider. Villa carried the heart of a giant and when tried and tested would move mountains for his loved ones. In late 2014, Villard, his wife Merci-Milia, and 2 of their children relocated to Florida in search of a better life; Poinciana, Florida became his final home. He maintained a great following of friends and extended family throughout the years. As time went by and age settled in, Villa developed a minor heart illness. However, despite his ailment one would never have known when he was in pain because he never showed it—Villa showed strength in everything he did. 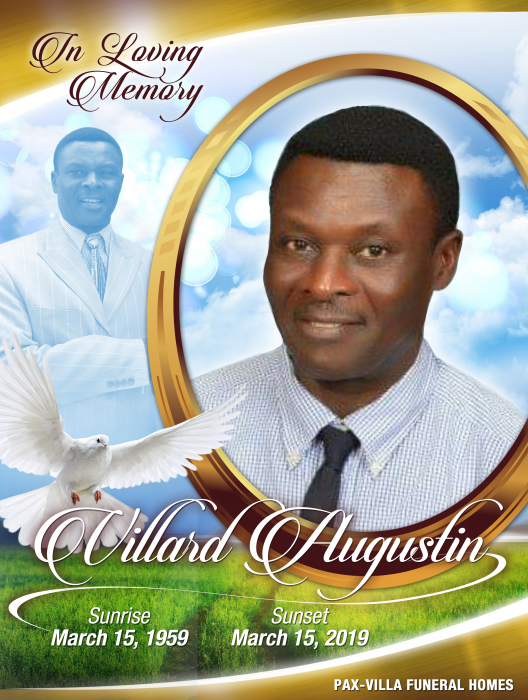 On his birthday, Friday March 15th, 2019, after being hospitalized for a few days, Villard Augustinwas called Home to be with the Lord. Other Relatives: Navilia Dorlus, Marie Paul, Estella Paul, Merilia Pharin, Marietta Charles, Dieudonne Charles, Deumex Beauplan, Elmira Destima, Ms Saint Luc, and Examene Paul.